David Dwertmann, an assistant professor of management at the Rutgers School of Business–Camden, is a recipient of a Bright Idea Award for his research on whether disability status influences the relationship quality between supervisors and their employees. 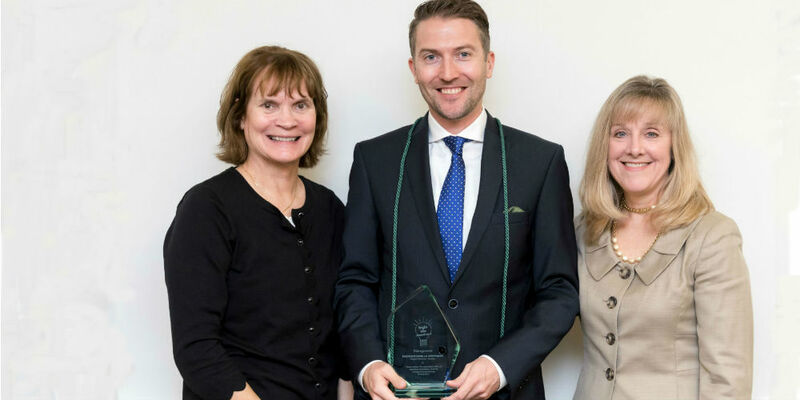 Dwertmann is among the faculty members from New Jersey university business schools to receive a Bright Idea Award from the New Jersey Policy Research Organization Foundation and the Stillman School of Business at Seton Hall University. This year’s award recognizes the top 10 papers from more than 160 publications by business school faculty in 2016. Dwertmann’s research, “Status Matters: The Asymmetric Effects of Supervisor-Subordinate Disability Incongruence and Climate for Inclusion,” focuses on factors that can negatively affect the relationship quality between a supervisor and a subordinate when there are health issues and disabilities. Through the research Dwertmann conducted with Stephan Boehm, an assistant professor at the University of St. Gallen in Switzerland, they suggest that supervisors with disabilities face potentially more detrimental relationship-quality effects than employees. They build arguments based on status discrepancy for supervisors who are expected to be hard-working and skilled, and people with disabilities who face stereotypes of lower performance, increased absenteeism, and so on. Importantly, the researchers also show that positive unit climates can buffer this negative effect, which provides leaders with a feasible way to prevent negative relationship quality and, ultimately, performance outcomes. The study was published in the Academy of Management Journal. A Philadelphia resident, Dwertmann teaches courses on organizational behavior and leadership at the Rutgers School of Business–Camden. He earned his bachelor’s and master’s degrees from the University of Mannheim in Germany and his doctoral degree from the University of St. Gallen in Switzerland. This is the 16th year of the collaboration between the NJPRO Foundation and the Stillman School of Business to celebrate the intellectual capital at colleges of business in the state.